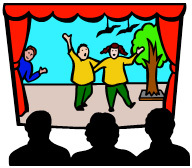 TheatreFriends is a free theater program designed by student board member Tessa Southwell. Our mentors are teens with experience in local school and community youth theater, and their program includes playwriting, acting, singing, dancing, props, and theatrical makeup. This inaugural program was held at the Boys & Girls Club of LA Harbor at their San Pedro site during the summer of 2013. The program has also been held at 135th Street Elementary School, Harry Bridges Span School, and the Boys & Girls Club of the Port of LA.